Just as poinsettia has become the Christmas flower, so rosemary is the Christmas herb. But it is more than a herb in the conventional sense; think of using rosemary for Christmas decorations, gifts, table settings, festive wreaths and festive feasting. It ticks all the boxes and has the bonus of the most delicious fragrance, which will stay in the memory. After all, fragrance is the most evocative of memory triggers. Rosemary is as fragrant as pine, and even the leaves resemble pine needles. Using rosemary for decoration is a natural way to perfume the home. If used to decorate the table, guests wont’ be able to resist rubbing it with their fingers. The scent of rosemary either energises or calms; a great way to make guests feel at home. Front door wreath: Make a traditional wreath, round or heart-shaped, or just pick an armful of branches, tie them together with florist wire, and finish it off with a big red ribbon. How to make a rosemary wreath: You need clippers, florist wire, ties and a ring or heart shape. Tie together three sprigs of rosemary, and tie them onto the ring/heart. Repeat with more bunches until the ring or heart is full and the look is that of a green garland. Attach the wreath to the door, hang it from the ceiling, or use it as a centrepiece on the dining room table. Leave it plain or decorate it with ribbons, bells, tinsel or coloured balls. 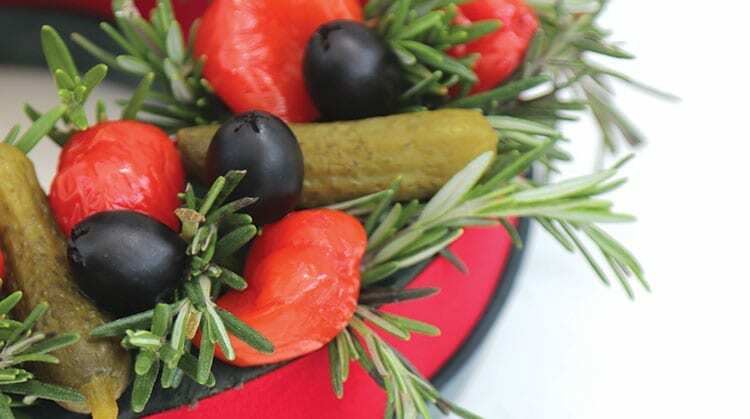 Try this: An edible wreath as an appetiser! 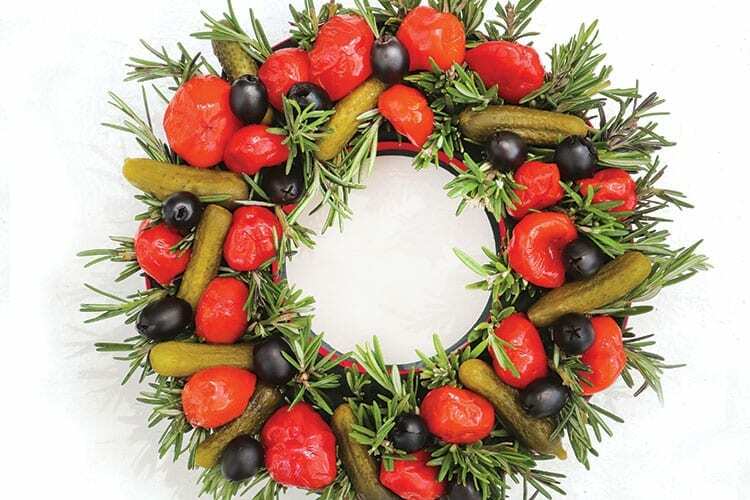 Make a rosemary wreath using a florist oasis ring, push in toothpicks and spike on tasty snacks like stuffed olives, gherkins, cheese, and peppadews. Table napkin rings: It can be as simple as winding a sprig of rosemary around the napkin like a serviette ring. If you have fancy serviette rings, just slip a sprig in with the ring and dress it up further with bells or ribbons. For an earthy look, tie a piece of hessian around the serviette with rough string and stick in a sprig of rosemary. Cut a plain white piece of card, write your guest’s name (in decorative script) on it and attach a sprig of rosemary, or push the twig through the card. Glue two small wooden twigs together, leaving a section unglued into which to slip a place name card and a twig of rosemary. Use a recycled can, make holes in the bottom, plant up a small rosemary bush, decorate the tin and add a place card with the guest’s name. When the meal is over, they take the rosemary home as a gift. 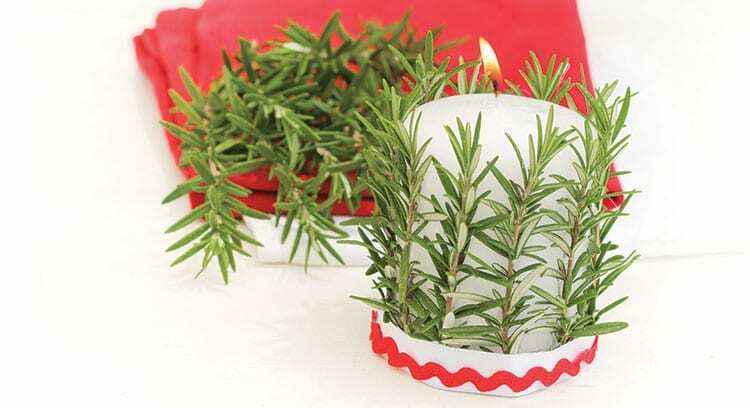 Rosemary-decorated candles: Candles always add to the festive atmosphere, and the heat will also release the rosemary fragrance. 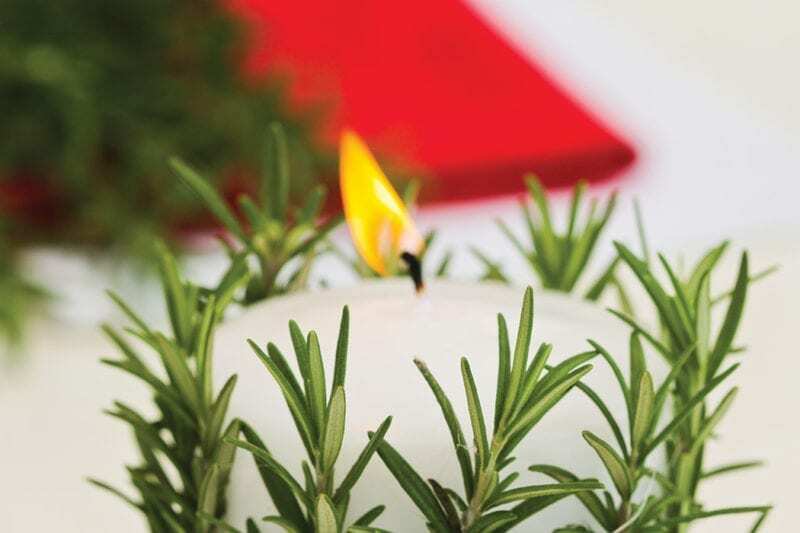 Make a rosemary wreath as a base for the candles or tie a piece of hessian around a plain white candle using rough string, and push in a twig of rosemary. Table decorations: A mini-rosemary topiary (shaped as a ball or like a pine tree) decorated like a Christmas tree is a perfect table centrepiece. Fill decorative glass jars or your favourite vases with branches of fresh rosemary (guests will love the fragrance) or make a long, low arrangement down the centre of the table using rosemary with oranges, grapes, roses and succulents, interspersed with glittering decorations. Rosemary is a symbol of friendship, loyalty and remembrance, and a home-made gift is one to treasure. Lightly bruise 200g of fresh rosemary (make sure the leaves are dry) and put into a sterilised bottle or jar. Pour in 500ml oil, to completely cover the herbs. Seal and put the jar on a well-lit windowsill or in a warm room. It should not be directly in the sun or near a stove. Shake the jar at least once a day. Within a fortnight the oil should be ready. Taste the oil, and if the flavour is not strong enough then repeat the process with fresh herbs. Good idea: Leave the sprig in the bottle, but make sure the oil is used within three months. Use in marinades, salad dressings or in a stir-fry – in fact, for any dish that requires oil. Melt glycerine soap (available from a craft shop) in a microwave oven or in a double boiler on the stove, and ad drops of rosemary essential oil. Choose a container from which the soap can be easily poured. Melt the soap slowly and don’t let it boil or burn. The ideal soap temperature is 85°C, and it sets at 72°C. Temperatures above 95°C will make transparent soaps turn milky. Let the soap cool slightly (let it form a skin) before pouring it into a mould. Before pouring, lightly scatter the base of the mould with fresh rosemary flowers and leaves. Always remove the skin that forms on the melted soap surface. If the skin goes into the soap it will be visible in your finished soap. Allow the soap to set completely before removing it from the mould. If you put your hand on the back of the mold and it feels completely cool to the touch, it is ready to come out. Never set soap in the fridge or freezer to cool as it absorbs moisture and becomes sweaty and sticky. Good to know: Glycerine attracts moisture so don’t make soap on a rainy day or cook while soap making. Package soaps as soon as they are made, in cling film or in cellophane sleeves. Culinary herb bowl for home-chefs! Plant up a bowl or hanging basket with rosemary, Italian parsley, oregano, lemon thyme and garden mint. This is a great combination for meat dishes, Italian dishes, slow food and roasts. Although their water needs differ, oregano, thyme and rosemary have shallow root systems that occupy the top two-thirds of the container, while parsley and mint, which need more water, send their roots to the bottom of the container where they take up all the water that drains through. Try this budget beater: Recycle tin cans by punching holes in the bottom, filling with herb-potting mix, and planting with a small rosemary. Glamorise the can with wrappings and ribbons and hand out to all your friends who love herbs. Braai or roast – that’s usually the choice when planning the family feast. Rosemary, of course, is the perfect partner for either. For the braai: Use this tasty marinade for lamb or chicken: 2 tablespoons of fresh rosemary, ½ a cup of lemon juice, 1/8 of a cup of olive oil and 1 lemon, sliced. Let the meat marinade overnight. Use sprigs of Rosemary ‘Tuscan Blue’ as meat skewers or rosemary branches as a basting brush. For the roast: Rosemary pairs particularly well with chicken and lamb. Chicken (or turkey): Stuff fresh sprigs of rosemary into the cavity so that the flavour infuses from the inside. If the chicken is stuffed, simply add sprigs above and below the bird while roasting, and tuck some into its elbows. Remove the sprigs when cooked. The gravy will have a delicious rosemary flavour. Lamb: Rub finely chopped rosemary and garlic mixed with lemon-juice onto the meat and roast. Alternatively, stud the leg of lamb with garlic and sprigs of rosemary, and let it rest for at least an hour before roasting. Add more garlic and rosemary sprigs, with veggies, to the roasting pan. Rosemary roast potatoes: Toss par-boiled potatoes (halved) in butter, salt and chopped rosemary. Place on a very hot baking tray and roast in the oven for 45 minutes or until gold and crispy. Turn a few times while cooking. Cheers! For a rosemary flavoured cocktail with a kick, bring a handful of rosemary sprigs, 3 tablespoons of sugar and 2/3 of a cup of water to the boil, and simmer for five minutes. Strain and pour the cooled mixture into a jug full of ice cubes, and top with 450ml chilled ginger ale and half a litre of orange juice, and finish by adding vodka or flavoured cane spirit. Plant in full sun, or in a container. Allow space to grow, at least 1m. Look out for: White- or pink-flowering rosemary as an alternative to the traditional blue. There is also a ginger-flavoured rosemary. Rosemary ‘Irene’ is a cascading variety for tumbling over embankments or out of containers, and creeping rosemary is an extremely drought-tolerant variety with thin, needle-like, grey leaves.